Many people don’t realize that there are place to go skydiving in Hawaii. Your on vacation and what a perfect time to live a little. 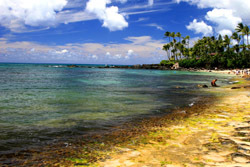 Hawaii is one of the most scenic places in the United States so where better to make a tandem skydive? Skydiving is fun anytime but imagine freefalling over the beautiful water of the Pacific and landing just on shore. It would be something you’d never forget. Check out the drop zones below for your first skydiving experience.